Patients and their physicians in southern Indiana identified a growing need for physical therapy as an alternative to opioids, imaging, and surgery, and we are pleased to provide them with one. 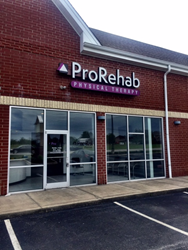 ProRehab Physical Therapy (PRPT) is pleased to announce the opening of their 10th clinic in the Cobbler’s Crossing neighborhood in New Albany, Indiana. Located at 5710 Charlestown Road in Suite 102, the group’s first southern Indiana location opened its doors to patients on May 1. Physical therapy services offered from the clinic will include orthopaedic physical therapy to reduce and prevent aches and pains in the musculoskeletal system, metabolic conditioning, and blood flow restricted training. Directing the Cobbler’s Crossing clinic is Adam Campbell, PT, DPT. Campbell enjoys treating patients of all ages, ranging from youth athletes to the geriatric population, and makes it a priority to get to know each and every one of his patients on a personal level, making them a specialized treatment plan according to their specific needs. He specializes in a broad range of treatments, including hands-on manual therapy and dry needling. “Since opening our doors in Louisville in early 2015, ProRehab’s mission has been to provide kind, compassionate, and positive physical therapy to each and every patient throughout the course of their care, and to make that care available to all. Patients and their physicians in southern Indiana identified a growing need for physical therapy as an alternative to opioids, imaging, and surgery, and we are pleased to provide them with one,” said David Boyce, ProRehab Physical Therapy Partner. For more information about the Cobbler’s Crossing clinic, or to book an appointment with Adam Campbell, please visit http://www.prorehablou.com. ProRehab Physical Therapy is Louisville’s largest locally owned private outpatient physical therapy practice. Our therapists are the Best First Choice in musculoskeletal care and provide long-lasting outcomes without surgery, medication, or diagnostic imaging to our patients across Louisville. Our staff has a wide range of clinical expertise in manual physical therapy, spine care and rehabilitation, general orthopaedic conditions, hand injuries, workplace injuries, metabolic conditions, and more. Additionally, our allPRO Sports Performance program offers specialty training to provide athletes with the most current sport-specific strength and conditioning programs. For more information, find ProRehab Louisville at http://www.ProRehabLou.com, on Facebook, or @ProRehabLou on Twitter and Instagram.